Two weeks until we leave and it’s great to hear from people who are reading along with us. As I’ve said to a few of you, I think I’m enjoying the blog writing process more than Oliver, at least for now. My friend, Malcolm, first gave me the idea of blogging. 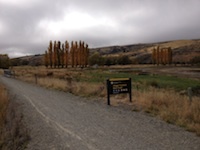 He suggested that I set up a blog for my recent 5 day bike tour in Central Otago, New Zealand. 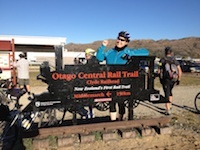 In mid April this year, my brother, Gary, and I rode the Central Otago Rail Trail; 150 kms on gravel along a former railway line that once linked a series of small gold mining towns, from Clyde in the west to Dunedin in the east. We had an amazing adventure and took some great photos. But internet connections were hard to come by, which would have made blogging tricky. 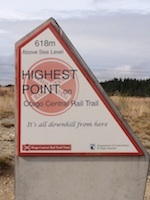 And I was too exhausted at night after riding up to 60 kms a day to do more than eat and fall into bed. So instead, Gary filmed quite a bit of our journey using a camera mounted on his helmet! On our European trip, Oliver and I will have more reliable internet connections as well as iPads and my laptop, which should make the blogging process easier on the road. The second is Lisa McKay, who I knew as a Masters of Forensic Psychology student back at the University of New South Wales. Since then, Lisa has completed a second Masters degree in International Peace Studies at University of Notre Dame, travelled the world providing psychological and spiritual support to humanitarian workers, written two very successful books, fallen in love over the internet, and started a family! Lisa blogs at lisamckaywriting.com, writing beautifully about journeys, home, family, love, spirituality and more. In a separate post we might summarise our blogging equipment and apps to inspire you to blog on your next trip (that’s you Thomas, Jamie and Emily!). 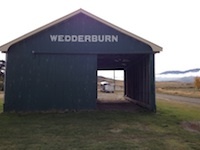 This entry was posted in Before our trip on June 1, 2013 by Amanda Barnier. It’s so exciting that you two are going on a big trip. I remember traveling in Europe when I was nine, and I remember keeping a journal, but now I don’t know where it is. I wish blogging had been around then, maybe I’d remember more than mountains, goats, and Swiss Chocolate and getting to eat ice cream for breakfast after the flight 🙂 . Can’t wait to read about your adventures!! And thanks for the shout out. Hi Lisa, I will keep the icecream after the flight in mind! I hope people enjoying reading about our travels as much as I have enjoyed reading about yours!